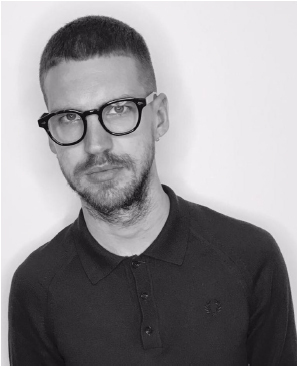 Having spent the last 16 years working as a stylist in some of London’s most reputable salons, Scott has earned a reputation amongst his loyal clientele as a calm, cool and consistent stylist with a fine eye for style, and a intuitive knowledge of what suits your face shape and hair. The most senior level of stylist at Larry King, Scott has gained a wealth of knowledge through working around the world on photo shoots, fashion shows, music videos and TV shows both alone and with some of the biggest names in the industry. Scott has great appreciation for style, music, popular and sub cultures across the decades has influenced his effortlessly modern style of hairdressing that has culminated in his creation of the “Thickening Haircut”. Book with Scott if you’re looking for a calm experienced stylist, who totally understands his clients and their hair. Perfect for the Fine Hair Remedy. Scott is also nicknamed “Jackanory” in the salon for telling THE BEST stories and is our resident ska and reggae DJ.